Centropy provides order from Chaos by capturing the systemic network of Spreadsheets links and presenting them in in an easy to follow automated Lineage Map. All spreadsheets with External Links on the available drive/s are found and the various chains of linked sheets can be displayed from as few as two sheets to as many as forty, in cases where complex calculations and formulas are incorporated. It is not limited by data content. All spreadsheets are included to highlight the variety of spreadsheet systems unknowingly formed by the wide array of end users. Any or all sheets could be impacted when a link is broken and the calculation no longer computes. In a nutshell, Centropy captures the systemic network of spreadsheet links and provides a transparent Dependency Map of the spreadsheets that underpin the business workflow. Further rescans highlight the changes and display the critical inter-dependency links, providing transparency of the usual business workflow and subsequent changes to that workflow over time. On-going rescans provide auditability and assists governance of critical spreadsheet systems and these rescans can be scheduled to occur as frequently as desired accordingly with your business purposes. With tens of thousands or even millions of spreadsheets that your business has created over time, there will be thousands of spreadsheets that have interlinking and overlapping dependencies on one another that enable your business workflow. It is, therefore, important to know who and what are affected by these dependencies prior to anything being removed from any system. Data sets, calculations or component sheets removed from an inter-linked system could result in null values where links are broken. It is difficult to discern which sheets are no longer required before safely archiving, without causing disruption, particularly when secondary users inherit or add to the mix. 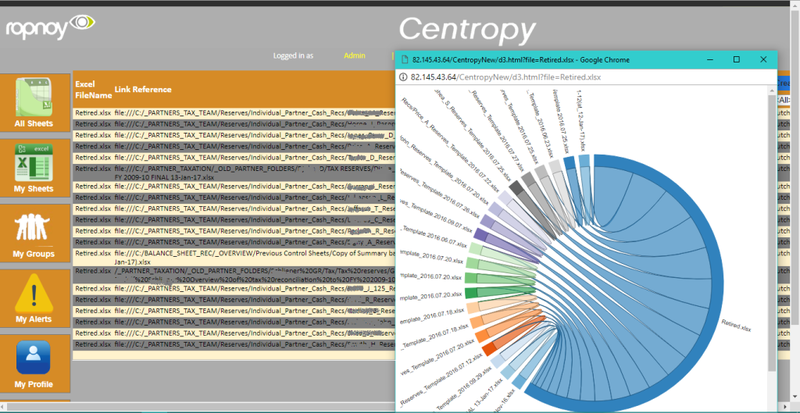 The Centropy lineage map provides both visibility and transparency of these links, and also provides an audit trail with subsequent rescans. Over time, these rescans highlight which systems are most active. By comparing the active ‘last edited’ spreadsheets with the spreadsheets ‘systems’ in place, the most active systems will validate which have the greatest impact on business dependency. Highlights change to system lineage since the last scan date. Includes additions or removals from each spreadsheet system together with the corresponding list of all the sheet editors. Enable Spreadsheet Governance without changing how end users work. Why should you include Centropy as a BAU tool? Nothing is lost, copied, duplicated or transferred elsewhere and no spyware or agents are used. Everybody Wins: – your business works leaner, faster, better, smarter but stays the way you want it. Fast to provide outputs Capable of scanning up to 10,000 spreadsheets per hour (depends on size of sheet and volume size). Available as a SNAPSHOT and quarterly/annual license service for real time and non-real time knowledge of system lineage. For the firms overall Governance strategy. The firm’s reputational risk is at stake when it doesn’t know what data it needs or where precisely it is stored or duplicated. Spreadsheet lineage will help to limit where to search. Firms need to step-up their preparation to be compliant with transparency requirements from regulators. The cost of maintaining all the data back-ups exceed what is yielded by the data itself for the business. The firm plans to move its shared files to new locations and spreadsheet links are broken. If the End User trust and confidence in support of their data is compromised. When costs need to be saved for unutilised data sets or for those that could be exchanged for cheaper alternative data sets. Save time on data loss and recovery. Understanding the map of linked Systems uncovers where to investigate for errors within spreadsheets, and implement best practise without changing the way that your business works today.